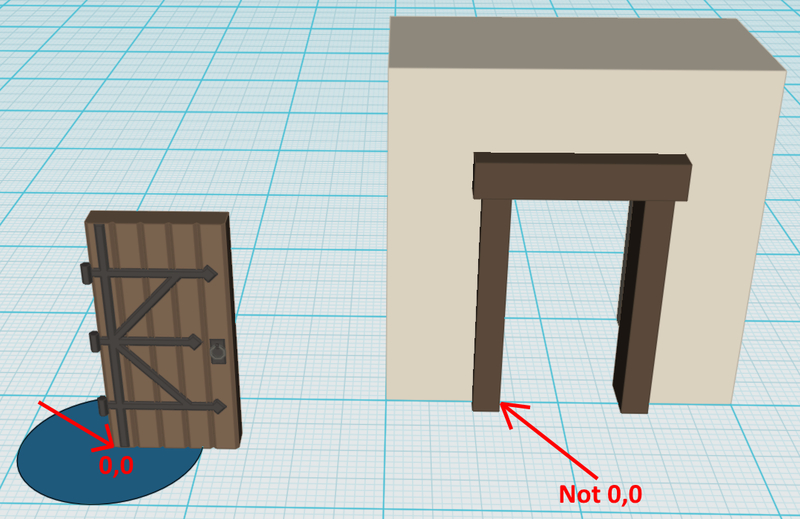 Right now, in order to create a model for a door that lines up properly in Assetforge "for placement", the door's hinge can't be at X 0,Z 0. Instead, the door has to be offset in such a way that it can be placed easily a doorway. 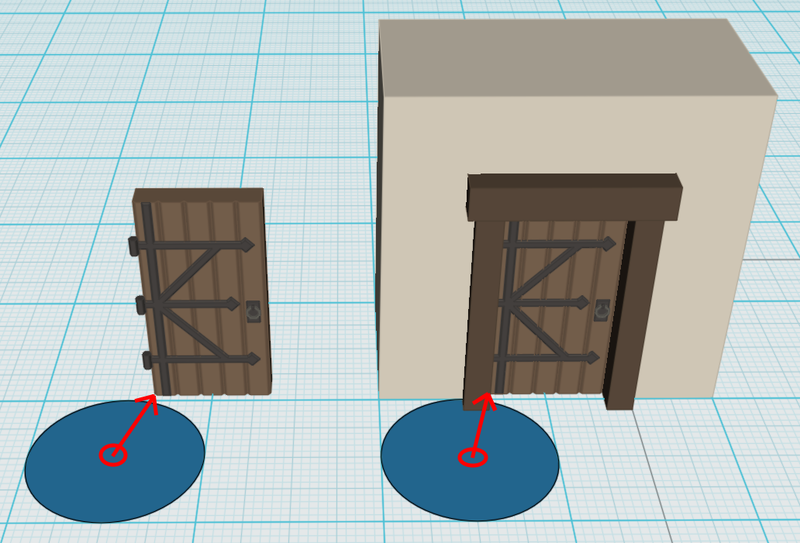 Now, when the final model is imported into something like Unity, a rotation operation performed on the door causes it to rotate at a strange angle instead of at the hinge. Import the door with the hinge at 0,0. 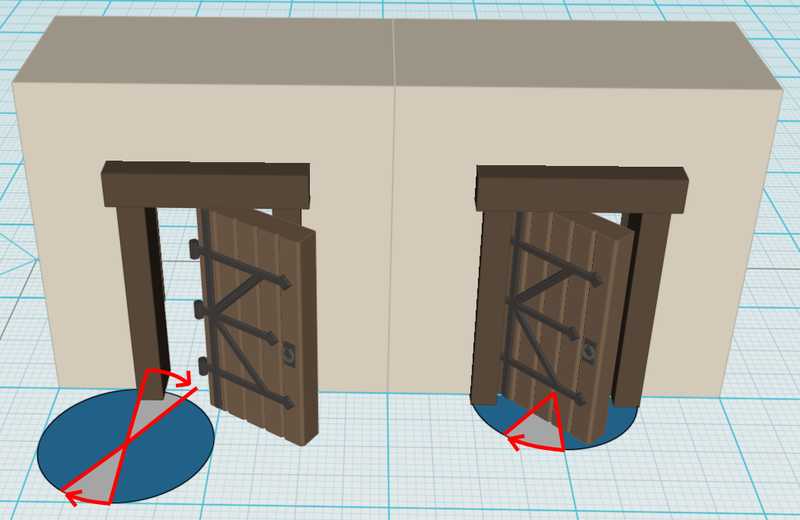 Use Assetforge to translate the door to fit in the doorway. Export the model or model group in such a way that the original 0,0 for the door is kept. I know this can be done by making the models the children of an empty object. Maybe this will have to be in the custom Assetforge format. Allow this exported model/model group to be included with the other models in the collections subfolder, so it will show up in the model palette. This way we can include these Assetforge group exports along with the other models when we distribute. That would require metadata to be included which is not assured any target software can actually read and use. The .OBJ exports are containing objects with meshes inside, so I think it would work without metadata. Still, if you export as FBX, it would be a problem. I corrected my first post at the end per your reply, Notthedan. The final export shouldn't include the empty object I mentioned in the custom Assetforge format. Instead, the export should export the door directly with the other models. To calculate the door's new Transform, you would combine the containing object pos/rot/scale with the door's own pos/rot/scale (i.e. containing object pos at 30, 20, 25 and the door pos at -0.5, 0.0, 0.5 equals an exported door position of 29.5, 20, 25.5.) Performing a rotation of the door would rotate perfectly on the hinge still, since the actual model began with the hinge at 0,0.